Freedom and growth improve life for everyone. Evidence and the current news. Easy and moderate walks in Shoreline. Especially May 3. Reality has been outrunning satire for a while in the Age of Obama, but the folks at Saturday Night Live seem to think they can pull it off. As we approach the shifting deadline for Obamacare enrollment on Monday, Obama adviser “Mike” (he looks an awful lot like Obama flack Dan Pfeiffer) and social media expert “Mara” are featured talking Obama into taking promotional photographs that are guaranteed to go viral and deliver ten million additional sign-ups in the next 48 hours. How low will Obama go? Obama is shown submitting to a photograph in Pharrell’s hat [Buzzfeed] while holding sign touting Healthcare.gov. He takes a group photo with Kim Kardashian, Harry Styles, and BatKid holding “a cat dressed like Princess Elsa from Frozen.” Then comes the Pope (because “he’s hot right now”). As I say, reality outruns satire in the Age of Obama. The bit with the Pope makes me wonder: where is Father Guido Sardcucci? He isn’t familiar to the target demographic, but he would be able to make comedy out of the selling of Obamacare. For their final shot, the White House crew brings in Justin Bieber (Kate McKinnon) for an intimate photo. Now that is low, but lower than Zach Galifianakis and Between Two Ferns? This satire thing is hard. Click the photo to see it at PowerLine Blog. Or click here. How many uninsured now have insurance due to Obamacare? How many people who had no insurance last year now have it with Obamacare? Junking much of our health care system was a required emergency measure in 2010 because of uninsured people. (It was such an emergency that Congressmen were not given time to read the bill they voted for.) Since the uninsured forced Obamacare on us how many of the newly signed up didn’t have medical insurance before? Centers for Medicare and Medicaid Services (CMS) deputy administrator Gary Cohen, who directs the agency’s health insurance reform unit, said that CMS is not tracking information about previously uninsured enrollees. “That’s not a data point we are really collecting in any sort of systematic way,” Cohen said when asked how many uninsured people are signing up on the Obamacare exchanges, according to a tweet from National Journal’s Sam Baker. The state doesn’t know how many of these people were previously uninsured. So how does he know? Not by any method he talks about. But, more importantly, he is sure that all the criticism is from Republicans. An appointed member of a Washington health care oversight board told me the same this week -- that Washington Insurance Commissioner Mike Kreidler is not keeping track. No one knows. See also Megan McArdle at Bloomberg “A Key Obamacare Question We Cannot Answer." Senator Angus King, an independent democrat from Maine, told Fox News there is no such thing as Obamacare. You can’t sign up for it. I guess they didn’t give him time to explain that! Earth Hour is a world-wide event to symbolize “commitment to the planet,” whatever that is. It consists of turning off non-essential lights for one hour of one night per year. If it’s so honorable why not turn off your lights for the whole night? Every day of the year? They celebrate it every day in North Korea. See. And also see “Earth Hour: A Dissent” by Ross McKitrik at WattsupwithThat. California state Senator Leland Yee, who was a gun-control leader, was arrested this week for running guns. Running guns? In 2006, Yee was named to the Gun Violence Prevention Honor Roll by the Brady Campaign for his efforts that included co-authoring a first-in-the-nation bill to require new semiautomatic handguns be equipped with ballistics identification technology known as micro-stamping. In 2013, he stood with law enforcement officials and then-Los Angeles Mayor Antonio Villaraigosa to propose a bill that would regulate assault weapons. State Senator Leland Yee appeared in federal court yesterday in shackles, and faced a lengthy indictment for a series of corruption charges, including shocking allegations of gun-running – including shoulder-fired rocket launchers. Update: This has been a busy week for the Democrats. In Rhode Island the Democrat Speaker of the House Gordon Fox. In North Carolina Charlotte Mayor Patrick Cannon (D). And in California two more state senators, Sen. Rod Wright (perjury) and then Ron Calderon (bribery). All this week. But the news was busy with NJ Governor Chris Christie and closing lanes on a bridge. Not arrests. See Howie Carr at Boston Herald. The politicians can’t wait for the bodies to be pulled out of the Oso slide. Rep. Elizabeth Scott of Monroe and Snohomish County Councilmember Ken Klein of Arlington are blaming the responders and the response coordination in the first hours for deaths. Why rush to the cameras? Of course, because you weren’t there and your hind sight is perfect. President Putin’s violations of Ukraine and Georgia six years ago are hurting Russia’s economy. Investors don’t like lawlessness; they want predictability. They are pulling massive amounts of cash out of the country - $70 billion in the first quarter of 2014. The ruble has dropped 10% versus the US $ this year; that might cause a recession. Putin has his people eating out of his hand being the international tough guy, but he is hurting them. Jon Talton of the Seattle Times uses his weekly column to beat up on the Republicans, I mean, the Washington Legislature. He outlines their sins, at least a few of them. And the things they didn’t do during the 2014 session. But where was Governor Jay Inslee? Neither seen nor heard from. Then there were the sins of omission. Most notable were the failure to restore university funding to pre recession levels..
One big problem is structural. The Legislature’s committees are silos that prevent a holistic appreciation of economic needs, as well as how social and environmental issues interplay with the economy. Decisions made in silos? That’s why we elect our governor statewide - to be above all those divisions. Where was Gov. Inslee? Hasn’t been seen nor heard from. This is vote fraud. As important as improperly registering to vote is, this exceeds it. Melowese Richardson in Ohio voted six times for Obama and admitted it on camera. She was convicted and served eight months. But then a judge stepped in, dismissed her conviction and allowed her to plead no contest. Sometimes it is appropriate to take a case to the federal courts that has been dealt with in state courts. J Christian Adams at Breitbart says this qualifies. Where is AG Eric Holder? Felon Al Sharpton approves. Does Holder? Many people were shocked when Senator R. McAuliffe opposed the bill she sponsored. Seattle Times SB 5246 would have modified state teacher evaluation to be in line to get a waiver from President Obama’s No Child Left Behind Act and qualify Washington for $38 million in federal funds. Why would the senior senator vote against her bill, so it was defeated? The WEA. The leaders and lobbyists of the state teachers’ union opposed any connection of the evaluation of teachers with the results of their students’ learning. It would have included a component of student test scores. “When you look at OSPI documents as to the huge amount of money that is rolled over by school districts every year in Title I, they will be able to still provide the services that their students need,” WEA lobbyist Lucinda Young told a Senate budget panel March 3. So they have plenty of money. No, she didn’t say “plenty," she said “huge amount." A few dozen millions of dollars? Didn’t notice it. We won't forget this when reforms are rejected because the education establishment just needs more money. Via Liv Finne at Washington Policy Center. How is Obamacare on its fourth birthday? President Obama’s signature accomplishment passed four years ago today. It was partisan - all Democrats; not a single Republican voted for it. Remember what congressmen said at the time CNS News. "My heart is heavy with grief tonight at this turning point for the nation," then-Rep. Geoff Davis (R-Ky.) said in remarks on the House floor four years ago today, as the U.S. House of Representatives prepared to end debate and pass the lenthy, complicated legislation that established Obamacare. "This vote will define the America we will have in the future: massive tax burdens, rationed care, and intrusive bureaucracy," Davis continued. "Democrats are thwarting the will of the American people, taking them on a headlong rush toward socialism. This is based on a false premise that every need a person could have on Earth can be met by government. … "It raises taxes, violates your privacy, is policed by the IRS, intrudes on free choice, and hurts seniors. Now what do we have? It takes months to sign up. And when you have signed up sometimes you have not! And if you sign up for a plan, but then find you don’t need it you can’t cancel it, because that part isn’t built yet. Millions have their medical insurance cancelled because it is not legal under Obamacare. “If you like your doctor…” promise broken. “If you like your insurance…” promise broken. Hospitals are excluded from plans. Cancer patients cannot get the medication that keeps them alive. The poor can never rise in American? Wrong. Amy Chua, the “tiger mom,” has a book w her husband Jed Rubenfeld about how people are successful, titled The Triple Package. They say the study that claimed the poor cannot rise made a huge error; it did not include immigrants. They are many large cases of rising from poverty to wealth - in the US - now! Their triple for success is: superiority complex, insecurity and impulse control. I used Ecto for my blog for years, but it got in a strange error loop. And support never answers. I paid for it!! Goodbye. I am using MarsEdit to post this. Developed by Red Sweater. For testing I included a photo from my 2003 bike ride from Elliot Bay in Seattle to Cut Bank, Montana - a one-day ride past the east entrance to Glacier National Park. 803 miles and I enjoyed every one. Now that I again have productivity s/w for my blog I will be making more entries. 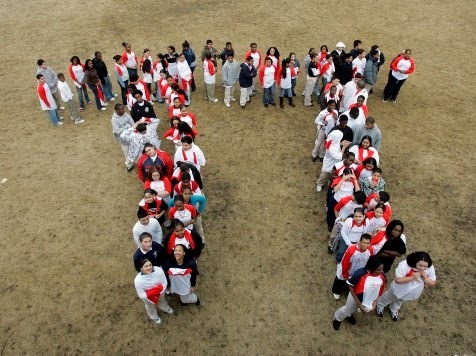 Today is Pi Day = 3/14 not= 3.141592…. It is the ratio of the circumference of a circle to its diameter. It is an irrational number, meaning it is not the ratio of two numbers. When written it is a never ending sequence with no pattern ever found in it. Celebrate it by - doubling your celebration at 1:59 pm. - Remember it is also Albert Einstein’s birthday. See more ideas at Wikihow. See also Pi Day. And buy a Pi T-shirt. 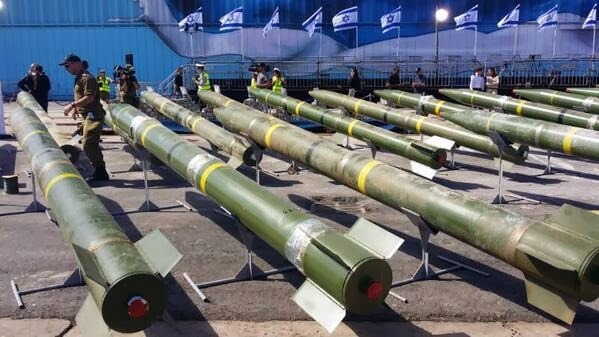 A shipment of arms bound for Gaza was stopped by Israel on March 5 in the Red Sea. It includes Syrian-made M-302 rockets and there is clear evidence they came from Iran. 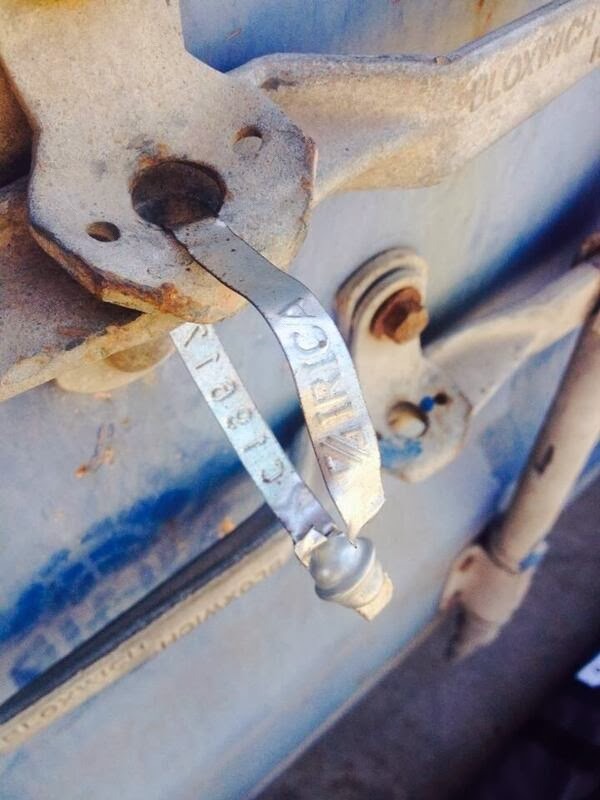 The missile containers have aluminum tags saying IRICA, which is Islamic Republic of Iran Customs Authority. They were hidden under bags of cement and the crew didn’t know there were aboard, they say. Iran’s chief nuclear negotiator Mohammad Javad Zarif “Our nuclear weapons program is peaceful.”) says the Israeli’s timed the capture to coincide with some conference. But his country sent the shipment, as we can see, and controlled the timing. Claudia Rosett is covering this at Forbes. And at PJ Media. The images are from Twitter. Bottom is the IRICA Iran customs tag. Click to enlarge. Where “that” is that the US is the best place for Africans to immigrate to. AND another about the origin of the slaves: "Here in Cameroon, as elsewhere in Africa, the knowledgeable guides who lead tours of the slave centers note that Africans were deeply involved in the slave trade, and that without them, the slave trade could not have existed. If only this fact were taught as readily in American universities as it is here in Africa -- not in order to minimize white complicity, but because universities should teach truth.? New President Pena Nieto of Mexico has made friendly with Communist dictator Castro(s) of Cuba and he is ignoring the brutal repression of dissent by Maduro in Venezuela. Why? Apparently he is afraid of leftist union backlash to the reforms he has put in place. And that Castro and/or Venezuela could influence the unions to cause him problems in the Congress or in the streets. He calls this pragmatism. Kissing Castro? That’s not pragmatic; it's embracing Communism - literally. I hope Mexico gives more thought about who are their friends. Andres Oppenheimer in Miami Herald. 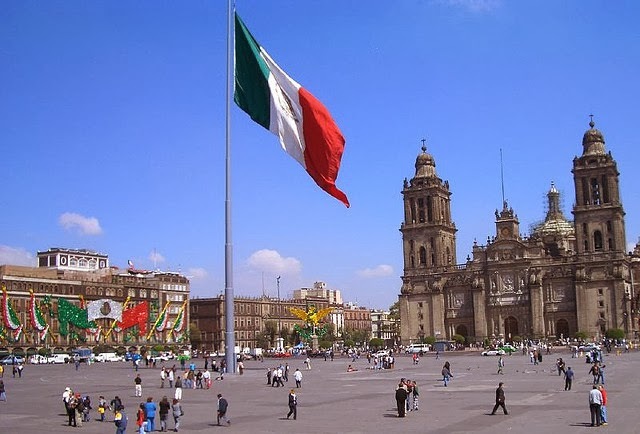 Graphic: Plaza de la Constitucion, Mexico City. Source: unknown. Another “one size doesn’t fit all” Obamacare debacle. There is no limit to the expense of providing eye care to kids under 18 with Obamacare for certain employers in Washington. In Walla Walla, WA, optometrists discovered this to their shock. So kids are walking out with $700 glasses, including $500 designer frames. Adequate glasses run $200 to $300. For children in Washington, Group Health, Premera and Regence insurance companies — at least — have interpreted the “no out-of-pocket” limit for this essential benefit to mean they will pay “100 percent of billed charges of regular or deluxe glasses” on some workplace-based insurance plans, he said. According to a side bar, this applies for businesses with less than 50 employees. In 2016 it will expand to those with up to 100 employees. This sounds backwards. Usually increased benefits hit large companies first and small ones later. Smile. You are paying for it. Israel is treating injured Syrian civilians who ask to cross the border. Israel has a field hospital a there. They say they were injured by Iranian missiles. Did Iran send a hospital for them? No, they say, just terrorists and bombs. Who is good here? Acting good? Is anyone here evil? Acting evil? In Washington, DC, with great fanfare everyone is proud of building energy-effiient buildings by the LEED standards; it is required by the city. BUT the new Green buildings use more energy. Not less. More! Take the Green Building Council’s Washington headquarters. Replete with the group’s top green-energy accolade, the platinum LEED certification, the USGBC’s main base comes in at 236 EUI. The average EUI for uncertified buildings in the capital? Just 199. Certified buildings’ average comes in at 205 EUI, still less efficient than that didn’t take home the ultimate green trophy. My method of policy implementation: 1. Plan. 2. Build/implement. 3. Measure the results of the program. 4. Correct: If it fails either kill it or fire everyone involved and find a way to do it right. This one looks like it needs to be ended. Will the greenies admit their errors? 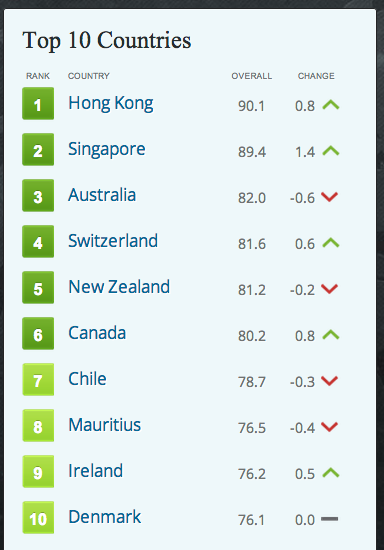 The USA is dropping in economic freedom. The US got passed by Canada two years ago. Canada is more free!? We always used to be in the top five. This year we dropped out of the top 10 and became #12 and dropping. Countries overall are gaining, but the US is dropping. Prosperity is closely related to economic freedom. I want prosperity for everyone; I care! More on North America at Heritage. More on the Index at Heritage with interactive charts. 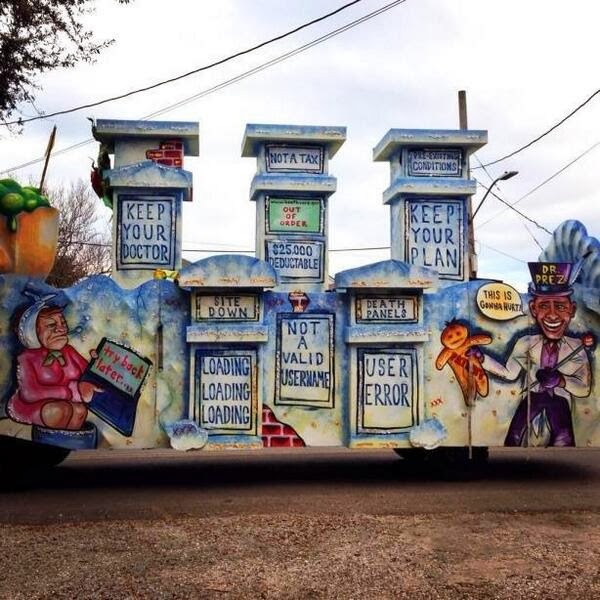 Some of the parade floats for Mardi Gras in New Orleans have already been unveiled. And at least three of them mock our president's signature accomplishment - Obamacare. One features a giant Obama head wearing a mask and an old-style doctor's head mirror, in his hands are giant bags of money. Emblazoned on the head mirror are the words "BUY or DIE." Other placards on the float include, "DEATH PANEL," and "BEND OVER." A second entry appears as a store front-like edifice with sayings painted in the windows and on the chimneys. One says "keep your doctor," another says "keep your plan." A painting of a woman on a computer sits steaming while her computer screen shows, "try back later." Another window says, "loading, loading, loading," while on yet another is written, "user error." This one also has the words "death panels." Opposite the painting of the woman on a computer is an Obama figure holding a giant stickpin and wearing a glitzy top hat and tails, the hat saying "Dr. Prez." Dr. Prez has a word bubble next to his head saying, "This is gonna hurt" and he holds a voodoo doll that says "patients" on it awaiting Dr. Prez' giant stickpin. So here is some rueful, dark Cajun humor for Mardi Gras 2014. Graphic found at FireAndreaMitchell. Click to enlarge. China, tell us how classy you are. On former Washington Governor Gary Locke's departure as US Ambassador, China's government newspaper said "Good bye" with racial insults. China News Service called Locke a “rotten banana,” a guide dog for the blind and a plague. And, yes, it is an arm of the government. It also blamed him for Beijing's smog. This is interesting, because during his term the US Embassy daily posted the smog level, which is unhealthy every day and sometimes dangerous. He was showing their dirty laundry. Good for him! But how did he cause it!? The chief law enforcer tells other law enforcers to break their oaths of office. How about the oath he swore to? Yes. Eric Holder works for Obama. But Holder’s job is to uphold our laws. So Holder is not doing the job he swore to. He only defends the laws he likes. And, even worse, he tells other law enforcers to act criminally also. … “Eric Holder apparently isn't satisfied with refusing to carry out his own oath to defend the Constitution, he wants to see state attorneys general do the same,” responded Carrie Severino, chief counsel to the Judicial Crisis Network (JCN). “But in a country under the rule of law, where the executive doesn't have free rein to declare laws unconstitutional by default, attorneys general should provide the same zealous defense all lawyers do. That means they defend their client even if they disagree, unless there is no viable argument to be made,” Severino, a former law clerk for Supreme Court Justice Clarence Thomas, pointed out. It is childish to only eat desert. Come on, become an adult. Sometimes you have to do things you don’t like BECAUSE it is your job. And you promised to do your job. (Of course.) It is adult to resign if you refuse to do your job. I am a retired operations researcher - that's using math and discrete-event simulation to solve business problems - in Lake Forest Park, Washington, which is the Seattle area. Hugh Hewitt LA-area law prof and talk radio host. Tribuna de los Cabos Baja California Sur news in Spanish. Trespassing on Einstein's lawn by Amanda Gefter - Journalist who was not at all a scientist took on the big questions. And became a first-class science journalist. STILL stalled; going to finish. The search below now works somewhat. That's an improvement, but still, it's flaky.